Mala beads are a beautiful talisman for all types of devout spiritual practitioners. Their stunning simplicity enhances meditative and prayer intentions; and, with spiritual wear re-emerging as a huge trend, the best mala beads are available in a variety of beautiful designs and colors. Although you may not have heard the phrase “mala beads” used before, chances are you know what they are if you have been inside any spiritual, wellness or yoga-related shop. Below are some of my favorite finds for mala beads, factors to consider when purchasing mala beads, as well as helpful tips on how to incorporate them into your daily meditation or prayer practice. What are mala meanings by color of bead? What is a mala bead necklace? How do you hold mala beads? What are mala beads made of? Bonus Guide: Meditate with Your Mala Beads in 3 Mindful Steps! DIY: How to Make a Mala Today! 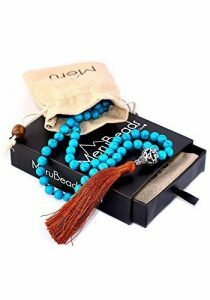 Best Buddhist Prayer Beads for Meditation Review: MeruBeads is one of my absolutely favorite brands for mala beads. In fact, I was recently invited to join them as a Brand Ambassador! 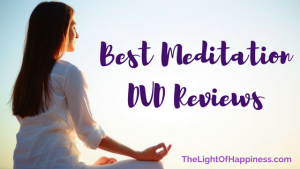 MeruBeads takes great lengths to support their customer and mala bead wearer with the finest-grade materials and an instructional booklet to supplement their meditation needs. MeruBeads has a beautiful variety of mala beads in a variety of high-grade precious gemstones (such as Amethyst, Tiger’s Eye, and Obsidian, just to name a few). Upon checkout on Amazon, apply the discount code “LOVLIGHT” to receive an exclusive 25% off savings! DharmaObjects Tibetan Buddhist Meditation Beads for Compassion Review: If you’re looking for a traditional take on Tibetan Mala bead necklaces, look no further. DharmaObjects has a beautiful collection of five different Tibetan mala beads, each made with traditional and authentic Bodhi seeds from Nepal. Each mala is approximately 58 inches long and features the traditional number of 108 beads. These malas come in five different colors: brown, orange, black and yellow and each comes with a beautiful, handcrafted silk brocade pouch for storage. Sandalwood Wrist Malas Review: Hands of Tibet has a beautiful offering of genuine, sandalwood wrist mala beads with a unique guru bead for your specific meditation needs. These lovely Tibetan beads are an excellent alternative to wearing them in necklace form, especially if you are particularly active and want something that will not be in the way as much if you choose to wear them on the go. These lovely sandalwood wrist malas come with fifteen different guru bead options, including popular choices like tiger’s eye, lapis and jade. Each wrist mala comes in a handcrafted, embroidered pouch with a Tibetan design. Freshwater Cultured Pearls Meditation 108 Prayer Beads Review: Mandala Crafts outdoes themselves again with this gorgeous, 108 mala made with authentic, freshwater cultured pearls, refined brass, turquoise and a delicate silver “Ohm” guru bead. This gorgeous set of beads is made with durable elastic, allowing this 24-inch masterpiece to comfortably and safely slip around your wrist should you choose to wear it that way. The freshwater pearls are a beautiful alternative to the traditional seeds or wooden beads and are comparable in size, ranging from 5.5 to 6.5mm each. 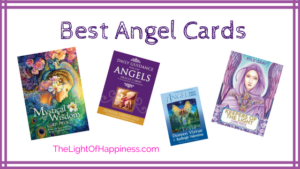 This is a lovely addition to your existing collection or would made an incredibly beautiful and thoughtful gift. 7 Chakra Jap Mala 108 Bead Necklace Review: CrystalShopIndia re-imagines the traditional mala beads with the sacred art of chakra balancing and alignment with this beautiful set of 108 mala beads. Made of uniquely colored agate beads, this mala piece is intentionally designed to help you focus and meditate on each of the 7 chakras as you work your way through the malas. This is a perfect set for practitioners interested in focusing on chakra alignment, healing, or anyone who appreciates the diversity of the agate stone. Amethyst Japa Mala Review: Awaken Your Kundalini’s mala beads may be one of the pricier options, but their superb quality is exceptional to the rest. This set of 108 amethyst beads are the most popular malas on Amazon. Not only are they noted for their superior quality and beauty, but also their incredible durability, weight, and soothing presence for the wearer. The heavier weight of these amethyst beads make meditating a more grounding and enjoyable experience; the amethyst stone is also a nice touch for anyone looking to use malas for third eye healing and psychic development work. Rudraksha Japa Mala Navkaar Creation Review: If you’re more of a traditionalist, you’ll absolutely love these mala beads made from the seeds of an Indian Rudraksha tree. This 108-mala necklace features hand-selected Rudraksha beads that have been blessed and strung along a beautiful red thread. Rudraksha seeds are extremely lightweight, making this a delicate touch to any outfit outside of meditation practice. Buddhist Prayer 108 Mala Beads Matte Onyx 7 Chakra Review: AmorWing has an incredible 108-bead set that stands out from the rest. These malas are made from 6mm black onyx along with seven different precious gemstones, each representative of the 7 different chakras (including tiger’s eye, malachite, amazonite, and lapis lazuli just to name a few). AmorWing malas are incredibly durable, measuring at approximately 29 inches around the neck. The elastic is also strong enough to support alternative wearing around the wrist as well. These malas arrive in a beautiful, champagne-colored collector’s box for storage. Health and Yoga Mala Beads Review: Based in India, SoulGenie features beautiful wooden beads strong on a super bright and powerfully blessed red thread. Each of these wooden beads are hand-painted a deep rust, red, or brown color, making each set a unique departure from the standard. Tibetan Mala Necklace for Meditation and Prayer Review: Tam Lyn Concepts is a Tibetan-based and owned shoppe featuring a lovely assortment of mala necklaces made with authentic, precious gemstones. Featuring three popular colors (pink, green, and black), the Tam Lyn Concepts shoppe hand crafts each mala necklace with precious gemstones, luxury silk thread, and a handmade silk tassel. These are incredibly fashionable and functional mala beads. An added bonus? Each mala necklace comes in a beautiful, handmade silk brocade pouch. 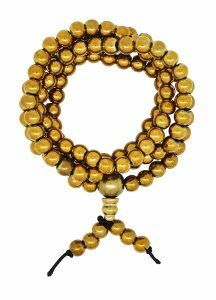 Yoga Brass Tone Tibetan Prayer Beads Review: This is an absolutely stunning set of handcrafted, natural yellow wooden beads featuring a unique guru bead with a calligraphic “Ohm”. Mandala Crafts proudly provides a beautiful range of mala beads suited for all types of practitioners with over ten different guru bead options, ranging from an anchor to owl and featuring the more traditional options such as a tree of life, Buddha head, lotus and elephant. These are truly lovely beads for those who value a unique guru bead as a powerful reminder for their practices’ intention. Udraksha Rudraksh Japa Mala Necklace Review: One to Avoid! You get what you pay for if you are trying to buy mala beads at an extremely low price. This shop, first of all, isn’t based in the US at all. 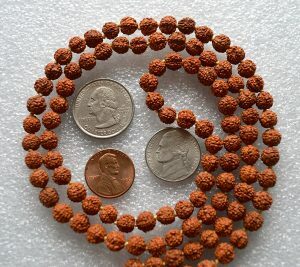 Secondly, these mala beads are not real Rudraksh seeds, they are simply wooden replicas that are painted with cheap-quality paint to look like them. Several disappointed buyers either never received their item, received their item many weeks later, or also realized that the seeds were fake when they realized that their clothes and hands were covered in the same colored paint as the mala beads! Remember to always read the reviews and if the price is too good to be true, it probably is. There are many different types of mala beads out there to suit a variety of personal styles, aesthetics, values and intentions for your mala beads. Since mala beads are also being worn outside of spiritual practice, many options are extremely posh and made with luxurious materials and appealing colors. Mala beads are intended to suit the personality of their user, which is why there are so many different kinds to suit any and all preferences women and men may have. If you haven’t visited Etsy before, chances are you may have heard that it is the “Amazon.com” but exclusively featuring independent artisans and purveyors of the do-it-yourself arts and crafts movement. Etsy features a similar, easy to use platform like Amazon that allows you to search for a product, read and write reviews and also interact with the seller. If you are looking for a more personal touch for your mala beads purchase, Etsy is a more artistic, independent alternative to Amazon and can open the doors for your opportunity to have an artist custom-make a mala necklace or bracelet for your liking. 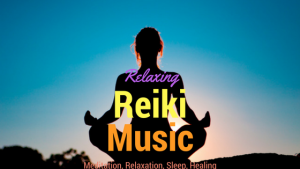 Top Pick for Mala Beads on Amazon – Amazon is my usual go-to, one-stop gift shop for all my shopping needs; Reiki and meditation related items included. If I need to buy a speciality item for my spiritual practice (in this case, my search for the best mala beads), I’ll typically try Amazon first because I can find a simple, well-made product at a reasonable price. Since I value a unique flavor to my aesthetics, my favorite pick for mala beads is the MeruBeads Premium Mala Beads Necklace. MeruBeads has a beautiful variety of mala beads in high-grade precious gemstones (such as Amethyst, Tiger’s Eye, and Obsidian, just to name a few). Each mala necklace varies depending on the intention you might have in your heart and even comes with a special booklet with instructions, tips, and mantras for deeper connection. MeruBeads is one of the most thoughtful, user-friendly and well-designed mala beads brands around. Again, I’m pleased to disclose that I was recently invited to join them as a Brand Ambassador! They’ve even offered an exclusive discount code to apply at checkout on Amazon. Enter “LOVLIGHT” to receive an additional 25% off savings! Top Pick for Mala Beads on Easy – Over on Etsy, I really love the mala bead offerings designed by BeginWithinJewelry (in particular, this stunning 108-bead Amethyst necklace, featuring an ivory Buddha guru bead). This is a very sweet, beautifully made mala mead necklace. BeginWithinJewelry sources some of the most precious, high-grade materials as an homage to the powerful, transformative beauty of the mantras to be invoked. Each of their mala necklaces features beautiful, high-quality gold-gilled beads, lavish and durable elastic thread or cord, and semiprecious gems and stones for beads. The seller offers a variety of unique colors (including gems, threads, and guru beads), lengths, and will also happily create a unique, custom order for you or a loved one. Mala beads are valued for their simplicity and anyone can use any materials to make them on their own; since they are to be used regularly, you are going to want to make sure that your mala beads can withstand daily practice and have high quality, durable materials for doing so. Quality Although the above mala bead recommendations have been vetted for outstanding quality and durability, you may decide to pursue other mala beads elsewhere. If you do, please give careful consideration to the quality of the mala beads you are purchasing. Read the reviews and product details carefully. You’ll want to look for the following to ensure your mala beads are top notch: elastic strength, weight of beads, type of beads, thickness of elastic and/or beads, and the length. Although some mala beads are beautiful and made with impressive materials, they may be too heavy for the elastic or cords they are strung on and it may deteriorate or break with use over time, which is why it’s important to ensure you have the best quality out there. Material The beauty of mala beads is that they are made with a diverse body of available materials these days: gems, handmade beads, semiprecious stones, and exotic woods, seeds, and felt beads. Pay careful and close attention to make sure that all the materials that are used for the beads are high-grade, quality materials. Make sure that any stones are real, that any wood or seeds are real and not painted over. You can determine this by reading reviews from previous customers and asking sellers to send additional photos so you can take a better look at the product. Red beads – the color red is typically associated with love, passion, and the depth of emotional passion and intensity. Red evokes the feeling of fire: it tempered, bright, wild and has a burning intensity. Red corresponds to the root chakra, which represents our need to feel grounded, safe, and passionate in our everyday lives. Pink beads – Pink is a romantic, playful and childlike color that represents the light, playful aspects of love (for either yourself or another person). Pink is traditionally used to heal matters of love and the heart and it is a popular stone for spiritual practitioners who are just beginning their meditation journey. Pink is associated with unconditional, nurturing and selfless love and is used for uplifting, heart-centered healing. Orange beads – Orange is a powerful color. Orange is traditionally associated with the sacral chakra, which embodies characteristics of leadership, vision, abundance innovation, and courage. Orange reminds us of the luminosity of the sun’s presence and asks us to be equally powerful, bold, and aware of all that we have in our lives. Yellow beads – Yellow is a friendly and chipper color associated with creativity, whimsy, friendship, and joy. Yellow is the perfect color for meditating on cultivating feelings of idealism, optimism, joy, relaxation and confidence. Green beads – The patron color of nature, green represents all that is alive, healthy, and full of vitality. Green is also associated with the heart chakra, representing unconditional, supportive love for self and others. Green is a beautiful color for meditating on themes of openness, selflessness, wellbeing, health, wealth, forgiveness, and love. Blue beads – Blue is noted for being the most open and friendly color. Just like the seas and the skies, blue represents expanse, peace, truth, tranquility and opportunity. Blue is associated with the throat chakra; therefore, blue is used to strengthen communication, speaking and living in your truth, and feeling at peace in the company of others. 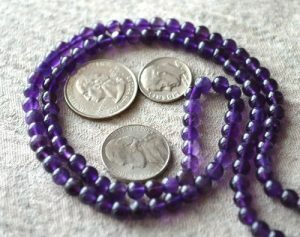 Purple beads – Purple is a powerful color. Historically, purple is the color of royalty because it is believed that represents higher, spiritual power and mastery of the ethereal world. Purple is also associated with the third eye chakra, which is responsible for intuition, psychic development, interpersonal dynamics, and finding truth in murky situations. Black beads – Black is used to invoke a feeling of groundedness and to fortify the mind and body from negativity. Black is used for grounding and protecting one’s mental and emotional energy, as well as to inspire a feeling of neutrality and stability. Contrary to popular belief, it is not a negative color at all; in fact, black is traditionally incorporated to restore balance in the spirit and body. Clear beads – Clear beads have a very cleansing, purifying effect on the wearer. Clear evokes the same cleansing, illuminating and purifying feeling as a quartz or a beautiful piece of glass. Use clear beads for intentions around clarity, peace, or revitalization. White beads – White is the purest of all the colors and is associated with healing, cleansing, and the heavens. White is a dreamy, ethereal, and nurturing color that is meant to enhance deep, spiritual connection, healing, and peace. Brown beads – Brown reminds us of wood, clay, and earth and it also carries the same healing proprieties of groundedness, strength, stability, and new beginnings. Brown is a beautiful and simple color to incorporate for intentions around strength, stability, resolve, and tranquility. A japa mala is a series of prayer beads used for prayer and/or meditation in the spiritual and religious customs of Hinduism and Buddhism. Japa Mala literally translates to “bead garland” in Sanskrit. It similarly corresponds to a rosary in Catholicism. 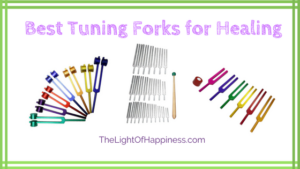 It is used to help count the number of mantras or prayers needed to complete a particular manifestation of your intention. The number of beads on a japa mala denotes how many times a mantra or prayer is to be repeated in use. Mala bead necklaces are the same as japa malas. You can wear the malas on your neck, but others may be keen to wrap them around their wrists several times instead. Each necklace will have several beads (usually 108 but may vary, especially if you prefer a specific length to wear as a necklace) and a special “guru” bead and tassel. The Guru bead, or, teacher bead, usually stands out from the rest of the necklace: it may be separated by a special thread or the tassel, it may be larger than the rest of the beads, or, may be an entirely different type of bead altogether. There are no clasps on mala bead necklaces and they can easily be placed over the head, neck, and onto the body for everyday wear. There is no wrong way to wear a mala bead necklace. It’s relatively easy to hold mala beads for use. First, hold the entire necklace in your right hand. Make sure that all the beads are in the palm of your hand, draped in between your index and middle finger. Slide the beads so that the first bead near your right thumb is the guru bead. Using your right thumb, starting with the guru bead, you will cycle through all of the beads in the necklace by sliding them through your index and middle finger using your thumb Each time you land on the next bead, you repeat your mantra, intention or prayer until you arrive back at the guru bead, then, you are done. There are various answers to this burning question. Mala beads traditionally have 108 beads because the number 108 is made of the numbers 1, 0, and 8, which are considered sacred in Tibetan Buddhism. The numbers 1, 0, and 8 respectively refer to the journey that humankind is to embark on in the spiritual plane, and the transmutation and fulfillment of this journey to pursue a higher goal. Other interpretations of traditional Tibetan Budddhism hint that 108 represents the total stages of soul development in a single lifetime. However, over the years, as mala beads are more popular, the number 108 is left open to the interpretation of the user, so long as your intention, mantra or even prayer is repeated 108 times. Mala beads are traditionally made of rudraksha seeds, however, since they are considered sacred, they are made of anything that is considered precious to either the user or their spiritual tradition. These materials can range from other types of seeds, woods, metals, and even minerals and gemstones. 1.) Location, location, location. 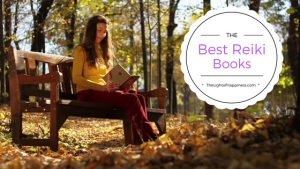 Make sure you are in a quiet and peaceful place where you will be completely undisturbed for at least 20 to 30 minutes. 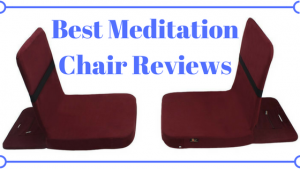 When you are ready, sit comfortably and close your eyes. Focus your awareness on your breath and connect with your intention to use mala beads. 2.) When you have a specific focus for your meditation using mala beads, see if you can get your focus down to a single sentence, such as “I am love.” Or “I radiate unconditional abundance”. When you have your phrase, or mantra, you are ready to begin using the malas to repeat. 3.) Hold the malas in your right hand (detailed instructions above) and begin repeating your mantra, either out loud or quietly, to yourself, until you have completed the rotation of the malas in your hand. When you are done, take several deep breaths and slowly open your eyes, bringing your awareness back into the room. I hope you enjoyed my thorough guide to mala necklaces. I wish you the best of luck on your search to find the right set (or even sets!) of mala beads to suit your meditation needs. May your mala beads bring you joy, healing and balance to your meditation practice and daily lives.